You'll be £24.00 closer to your next £10.00 credit when you purchase Battlecruiser Repulse. What's this? The subject of this volume was one of the last battlecruisers, elegant ships which combined a powerful armament with high speed, but much criticised for their light protection. Throughout their existence, they were controversial – three were sunk at Jutland – and Repulse herself was famously lost to Japanese air attack at the outset of the Pacific War. Nevertheless, the type was highly prized: Repulse and her sister Renown were the only capital ships given sufficient priority to be designed, built and completed during the course of the First World War; and substantial sums were spent on large-scale reconstruction during the 1930s. Both these phases of the ship’s life are fully documented in two separate sets of plans, which allows this novel form of anatomy to cover the whole life of the ship. 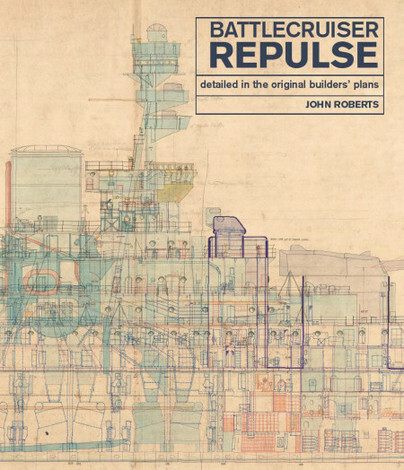 JOHN ROBERTS is one of the best-known authorities on twentieth-century British warship design. Co-author of two highly regarded studies of British Battleships and British Cruisers, he is also a fine draughtsman and produced a number of the volumes in the Anatomy of the Ship series, subjects including Dreadnought and Hood.